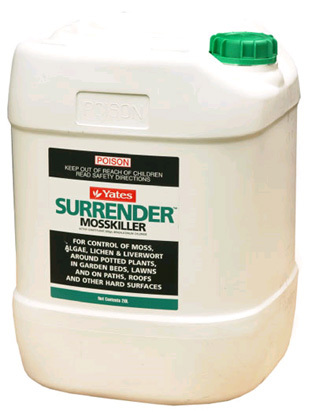 Yates® Surrender™ is a fast acting, easy to use formulation for the control of moss, algae, liverwort and lichen. It can be used for a variety of applications including around potted plants, in garden beds, lawns, on paths and in swimming pools, with minimum odour. It can also be sprayed over tiled roofs, rockeries, driveways, patio bricks, outdoor furniture, fences, walls and gutters. Surrender can also be safely used on painted surfaces, steel, plastic, synthetic materials, wooden and material surfaces. It has the added benefit that it will not stain. Algae will disappear within days, simply spray and walk away. Surrender has a powerful penetrating and wetting action facilitating rapid absorption of the active ingredient by moss, algae, liverwort and lichen. Surrender can also be used as a sanitiser for control of bacteria, certain fungi, viruses and bacterial spores. Active constituent is 500g/L benzalkonium chloride in the form of a soluble concentrate. For best results the application should be made around the root zone of plants. Surrender’s performance is greatly enhanced by warm moist conditions. Surrender is available in 1L, 10L and 20L packs. For information about the Surrender range or your local distributor’s contact details, call Yates on 1300 132 153.